In The Politics of Autism, I discuss various ideas about what causes the condition. I also write: "If the science were not confusing enough, its coverage in the mass media has added another layer of murk. News reports hype tentative findings and weak correlations as “breakthroughs” in the quest for autism answers. " 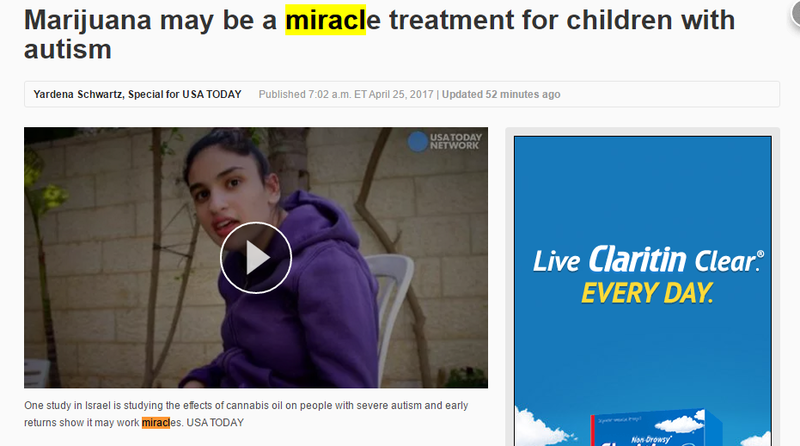 USA Today is running a story about research into marijuana as a treatment. Though the text of the story explains that the studies are ongoing and not conclusive yet, the headline uses the word "miracle," which is not in the article. This headline is bad for two reasons. First, there is a long, long history of "miracle" cures that ended in deep disappointment for autism families. Second, in this particular case, the reference to marijuana might lead some families to try it. Though some states have legalized it for medical or recreational use, the federal government has not. In other words, it is encouraging families to break the law and attempt a "treatment" that could have unanticipated consequences.